The Boston Red Sox are going to the World Series after eliminating the Houston Astros on Thursday. 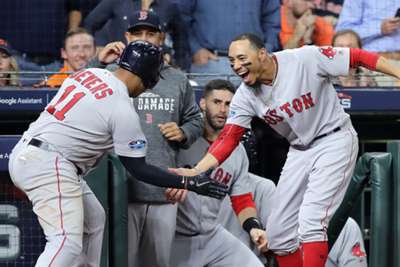 Boston took down defending champions the Astros 4-1 to lock up the American League Championship Series (ALCS) in five games. David Price was impressive as Houston never strung anything together offensively. The Red Sox will head back to the fall classic for the first time since 2013. Price is not a good starter in the postseason. Coming into game two of the ALCS, Price's teams had never won a game in which he started in the postseason. But the playoffs are all about matchups and Price has always matched up well with the Astros. Coming into Thursday's game Price had a career 6-2 record with a 2.94 ERA against the Astros. In the postseason he had posted a career 3.17 ERA in 11.1 innings pitched with 10 strikeouts. Price tossed six innings of three-hit, shutout ball with no walks and nine strikeouts in game five. To be clear, Verlander would never call out his team or express any kind of anger toward a group that helped him win his first World Series last season, but he should be extremely frustrated with them. Not just for their performance on Thursday, but because of their lack of production for him at Minute Maid Park all year. While Verlander was on the mound in game five, Houston scored no runs. This is not new for the Astros at Minute Maid Park with Verlander on the mound in 2018. Houston was shut out five times in Verlander's starts on their home field in 2018. The team scored three runs or less eight times and four or less 11 times in 19 starts. And it is all either mental, or the Astros really cannot see with the new batter's eye in the outfield. However, Boston scored eight runs in games three and four and another four while Verlander was on the mound in game five, so it could very well be in their heads. This season Houston scored 51 more runs on the road than at home and 3/4 of a run less per game away from Minute Maid (5.23 v 4.60). In Verlander's starts at home it was even worse as Houston scored 3.84 runs per game. Verlander is as close to perfect as it gets in the postseason, especially in elimination games, but he almost had to be perfect for the Astros to win at home this season and he simply was not on Thursday. It is his fault for giving up four runs in this game. It is his team-mates' fault for not backing him up – at all – at the plate. The team that hit better in the postseason wins. This is almost always true. In the last five World Series the team with the higher OPS have won. That has been true for eight of the last 11 as well. In the ALCS specifically, the team with the higher batting average during the season have won seven of the last nine series. Pitching is great to have and the Astros had all kinds of it this season, but Boston's hitting beat the Astros' pitching, smacking five home runs and 13 extra-base hits in the final four games to close out the series. The Red Sox were the best hitting team in a great hitting American League this year. They out-hit the Astros this series.